Aquarius constellation is located in the southern hemisphere. It is one of the 12 zodiac constellations. 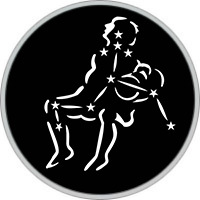 The constellation’s name means “the water-bearer” (or “cup-bearer”) in Latin and its symbol is ♒, which represents water. Aquarius lies in the region of the sky which is sometimes referred to as the Sea, because it contains a number of other constellations with names associated with water; Pisces (the fish), Eridanus (the river), and Cetus (the whale), among others. 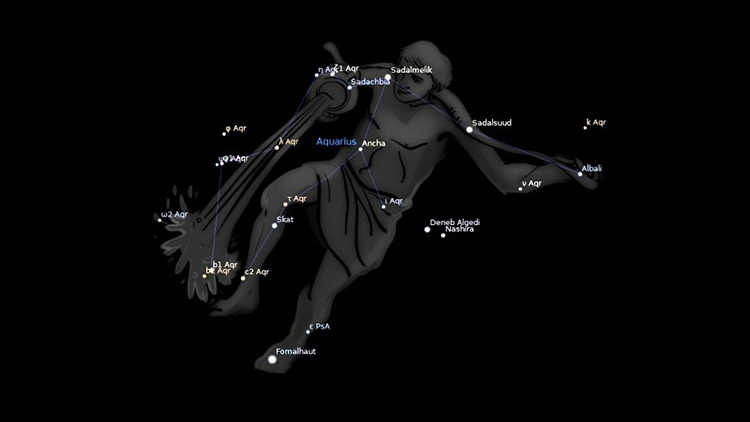 Like other zodiac constellations, Aquarius was catalogued by the Greek astronomer Ptolemy in the 2nd century. How to find the constellation Aquarius in the sky? Located almost on the ecliptic, Aquarius can be viewed by observers between latitudes +65° and -90°, where it takes up an area of 980 square degrees of the southern celestial hemisphere. It can be found directly to the east of Cetus, almost due west of Capricornus, and almost due north of Piscis Austrinus. Being a member of the zodiac family the Sun, Moon and planets all regularly travel within its boundaries. Aquarius’ almost universal association with water may be related to the fact that the Sun enters the constellation when many parts of the world are visited by a rainy season. It is also found in a region of the sky known to the ancient Greeks as the Sea due it containing several water-related constellations, including Capricornus (Sea-goat), Cetus (Whale), Delphinus (Dolphin), Eridanus (Great River), Hydra (Water Serpent), Pisces (Fishes), and Piscis Austrinus (Southern Fish). Aquarius is best seen in the Northern Hemisphere during autumn, or in Southern Hemisphere in spring. In the northern autumn, the constellation appears to be in the southern sky, while during the southern spring it is either high in the northern sky, or even directly overhead, depending on the viewer’s location. In terms of shape, it takes a lot of imagination to discern a figure of a man pouring water from a jar. Add to this the fact that it takes a dark night to see all the stars and objects that make up the constellation, and it becomes an even more difficult task to see the whole picture, so to speak. From urban skies, the constellation can best be described as a series of inter-connected triangles.